Mark Husmann is serial entrepreneur that has now started another very interesting project which caught my attention: he has been filming a documentary for the past fourteen months on an entrepreneur (himself) trying to create a successful billion dollar business during a declining economy. Jason Boritz and producer Jonathan Salemi, are the filmmakers making the movie on Mark. Cristian: Hi Mark, how are you today? Mark: Busy…still trying to raise money and put deals together. Cristian: I had a look on your site yesterday and saw you are making something interesting. A movie about starting a billion $ business with $100. So tell us a little about the movie. Mark: The movie is a year in the life of a serial entrepreneur (me) and all of the highs and lows I go through in the building of a new company. Cristian: Mark, how old are you? Cristian: And how many businesses have you started so far? Cristian: How do you come up with the ideas to start a business? Mark: Some are accidents …some I see an opportunity and enjoy the challenge of making it happen. Cristian: The theme of the movie is the creation of a successful business with just $100 investment, right? So do you think most people fear about not having enough money to invest? Mark: To an entrepreneur not having enough money will only slow them down…not stop them. Cristian: What if you fail to build the 100 to a billion business? Mark: I will enjoy the process and learn along the way. Cristian: How did you actually come up with the idea to make a movie? Mark: One of my manufacturers introduced me to his nephew (Jonathan) and after meeting for half an hour, he asked if he could do a documentary on me and the creation of my business. Cristian: I know the movie is not finish yet, but what’s the concept/ message? Mark: Don’t give up just because everyone says NO. It’s just a starting point. If you believe in what you are doing and you know that it will work…you won’t give up. Cristian: So what would be the in the movie target? Who should watch it? Mark: Anyone that wants to start a business and maybe has been stopped in the past from even trying. Cristian: From the trailer I got that you are a highly positive person. Is this a must for an entrepreneur? Mark: Absolutely… fear of failure is not an option. Cristian: How do you deal with bad mornings or simply with bad days for your businesses? Mark: I try and find one positive thing about the day and that moves me forward. Cristian: What’s the biggest mistake you did in your entrepreneurial path? Mark: Everything happens for a reason…so I don’t consider any mistakes the biggest. I try and turn “mistakes” into opportunities. Cristian: In the trailer your talking about you being a workaholic. Do you need to be a workaholic to be a successful entrepreneur? Mark: No…just focused and passionate. Cristian: How important is family and keeping balance? Mark: Big…family is your foundation and I need to keep reminding myself about balance..it’s tuff. Cristian: I wonder, how you define yourself? A successful businesses man? 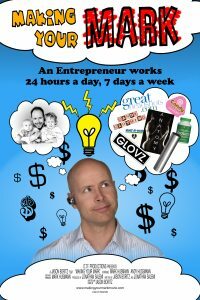 A serial entrepreneur? Cristian: How does the crisis modifies the movie perspective? Mark: The “crisis” has made finding money much more difficult but I see the down economy as an opportunity to make amazing businesses. Cristian: Any advices for people willing to start a new business? Mark: Do something different…stand out…take chances…leave fear to others. Cristian: Is the entrepreneur mission to make money out of anything, or doing what they like best and transform it in a business? Mark: To me it must be something I enjoy. As entrepreneurs we need to make money so that we can continue to create and help others. Cristian: So what’s the status on the movie? When it will be released? Mark: I think it will be released this year (2009).